"Kṛṣṇa said, sarva-dharmān parityajya mām ekaṁ śaraṇaṁ vraja, and nobody practically, except the Pāṇḍavas and few other devotees, nobody took it seriously. And what to speak of now. They are talking of Bhagavad-gītā, scholars of Bhagavad-gītā, but without Kṛṣṇa. That is their business. These demons, they are preaching Bhagavad-gītā without Kṛṣṇa. Nobody preaches about Kṛṣṇa. Nobody says what Kṛṣṇa wants. Sarva-dharmān parityajya. Kṛṣṇa wants this, but they are misinterpreting in different ways and diverting the attention of the people most foolishly, that... In the Bhagavad-gītā Kṛṣṇa is the center. So this is going on. You know, you are coming all from foreign countries. Bhagavad-gītā is popular in your country, at least amongst the scholars and theosophists and theologists. Going on, for the last two hundred years at least. But nobody understood Kṛṣṇa. That is the difference. Now for the last, say, five or ten years, because we are presenting Kṛṣṇa as it is, it has become very easy for you to accept it. Unadulterated Kṛṣṇa. Before this, everything was presented adulterated. Therefore there was no effect. 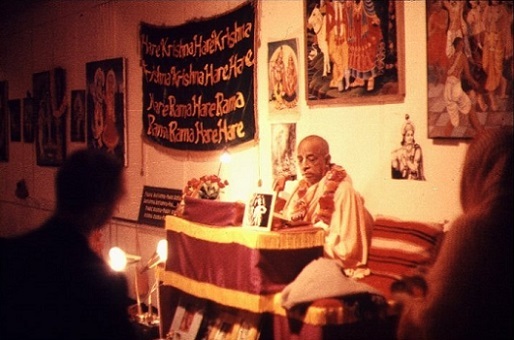 So if you push on this movement, unadulterated Kṛṣṇa, it will go on. It will go on. And as soon as you adulterate Kṛṣṇa, it will not go on. It will not be effective. You may be very good scholar or very good politician or this or that, but you'll never understand what is Kṛṣṇa. Nāhaṁ prakāśaḥ sarvasya yoga-māyā-samāvṛtaḥ (BG 7.25). If you want to pollute Kṛṣṇa, Kṛṣṇa will never be revealed to you. Sevonmukhe hi jihvādau svayam eva sphuraty adaḥ (Brs. 1.2.234). So by the grace of Kṛṣṇa you have taken the shelter of the lotus feet of Kṛṣṇa. It is great fortune for you. So do not adulterate Kṛṣṇa. That is my request."